Rare quality [A+ grade] optic gem grade twin smoky quartz crystals have a combined 17 FACES. 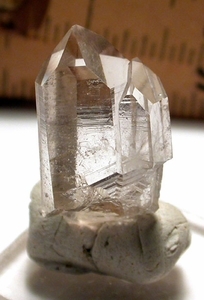 The larger crystal is uncommonly 7h faced, the smaller has 10! Record keepers, tiniest fleas to the taller crystal, and elegant geometric 'pleating' with rainbows towards the base. Large thumbnail, 7/8x 1-3/16", from Garland County, Arkansas.